Riley Ellison and Jordan James used to be best friends. They even had a column in their high school newspaper, writing "obituaries" of over used phrases, unwise fashion trends, etc., inspired by Riley's grandfather, a famous obituary writer. Then life moved on. They graduated. Their friendship broke up over a guy, Ryan, who became Riley's long-term boyfriend and whom she expected to marry. Riley is 24, and works in the local library as a library assistant. Jordan is a reporter at the local newspaper, the Tuttle Times. Then Riley's grandfather commits suicide. Ryan breaks up with her and goes to Colorado, where he has a new girlfriend. The residents of Tuttle Corner feel affection for her, but also pity. She decides to rejoin life. She signs up for an online dating service, and tries to reconnect with Jordan. And thus she discovers that Jordan has just committed suicide. Except the suicide note doesn't sound anything like Jordan. It's not long before Riley, who never accepted that her grandfather really committed suicide, is investigating Jordan's unlikely suicide. What follows is a strange adventure for her. Ryan is back in town. She meets an interesting guy, AJ, through the dating service, even though their first date is a disaster. An investigative reporter at the Tuttle Times has his own questions about Jordan's death, and he and Riley team up--even though the reporter, Will Holman, is a very odd character himself. It turns out there's an awful lot going on in Tuttle Corner that Riley never suspected. Taco trucks aren't just selling tacos. Something is odd in the police department, and Jordan may have been looking into it. Someone is threatening the head librarian, trying to force him to accept bookmobile trucks that will be fully paid for by the donor, who is willing to be quite violent about it. AJ's background is murkier than he lets on, and he might be connected to the events leading to Jordan's death. 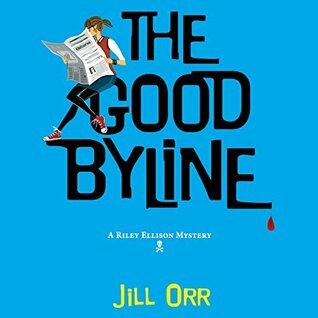 There's a lot here that seems unlikely, but Riley and her friends are likable, and the story is fun and lively. Dog note: There is a dog, and no, the dog does not die. Not much substance, but it's fun.